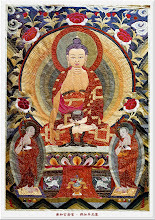 Dharma Realm Buddhist Association, 1996. Amitabha Buddha: The Great King of Dharma. Why do we recite "Namo Amitabha Buddha?" 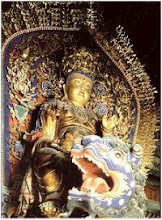 It is because Amitabha Buddha has a great affinity with living beings in the ten directions. 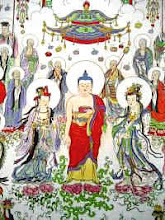 Before Amitabha Buddha realized Buddhahood, during his cultivation on the "cause ground," he was a Bhikshu named Dharma Treasury who made forty-eight vows. Among those vows was one that said, "I vow that after I realize Buddhahood, any living beings throughout the ten directions who recite my name will certainly realize Buddhahood. 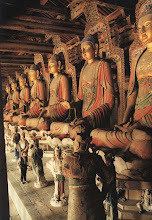 If they will not be able to realize Buddhahood, then I will not realize Buddhahood." The power of Amitabha Buddha's vows is like a magnet; living beings of the ten directions are like iron filings. 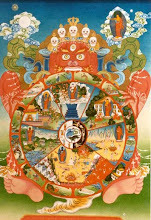 That is how he draws beings of the ten directions to the Land of Ultimate Bliss. What if they aren't attracted? Amitabha Buddha vowed that he himself wouldn't realize Buddhahood if they couldn't be! Therefore, all who recite the name of Amitabha Buddha have the opportunity to realize Buddhahood. Gathering All Beings into the Western Land. The Amitabha Sutra belongs to the category of Sutras that the Buddha "spoke without request." 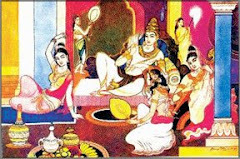 Why was that Sutra spoken without request? No one understood this Dharma-door, and so no one could request the Buddha to speak it. 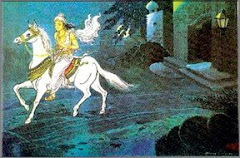 Although the greatly wise Shariputra was an interlocutor in the assembly, even he didn't know how to ask about this Dharma-door. Probably the Buddha couldn't hold back any longer, so he told everyone about this most convenient, most direct, most satisfying, easiest, and most inexpensive Dharma-door of reciting the Buddha's name. If a person can recite Amitabha Buddha's name "whether for one day, two days, three, four, five days, six days, as long as seven days, with one mind unconfused, when this person approaches the end of life, before him will appear Amitabha Buddha and all the assembly of holy ones" to guide him. Although most people find it hard to believe this Dharma-door, it is the most direct and certain practice. 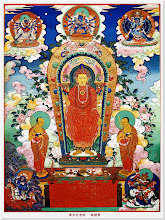 The Dharma-door of reciting the Buddha's name is appropriate for those of all three faculties and beneficial for both the intelligent and the stupid. Whether you are stupid or wise, you can realize Buddhahood. When one is born in the Land of Ultimate Bliss, where beings "endure none of the sufferings, but enjoy every bliss," one will be born transformationally from a lotus. We will not pass through the womb as in the human realm, but will enter a lotus flower, live in it for a while, and then realize Buddhahood. Day and Night Hold the Name with Concentrated, Sincere Mindfulness. 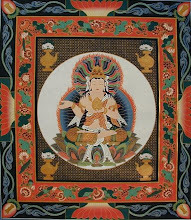 The King of All Dharmas is the one word "Amitabha." The five periods and the eight teachings are all contained within it. In samadhi will enter the Thus Come Ones' place of quiescence. 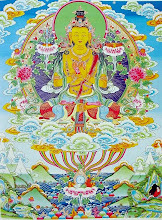 The King of All Dharmas is the one word "Amitabha. "/ The five periods and the eight teachings are all contained within it. The teachings are arranged in eight categories, four according to the nature of the teaching: the storehouse teaching, the connecting teaching, the special teaching, and the perfect teaching; and four according to the methods of teaching: sudden, gradual, secret, and unfixed. 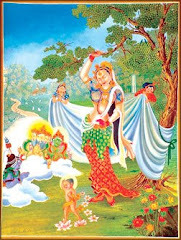 The five periods are: The Avatamsaka, Agama, Vaipulya, Prajna, and Lotus-Nirvana. These eight teachings and five periods are all included in the one word "Amitabha." One who single-mindedly remembers and recites his name / In samadhi will enter the Thus Come One's place of quiescence. Such a one will definitely go to the Pure Land of Eternal Stillness and Light, the Land of Ultimate Bliss. Living beings in the Dharma-ending Age will be saved by reciting the Buddha's name. And so whoever hopes to be saved should be mindful of the Buddha. Recite the Buddha's name one time more. And let your Dharma-body come alive. Don't look lightly on the Dharma-door of reciting the Buddha's name. Contemplate at All Times and Reflect Well. 1. Mindfulness of the Buddha through holding the name. This involves reciting "Namo Amitabha Buddha" over and over. Amitabha's body is the color of gold. The splendor of his hallmarks has no peer. The light of his brow shines 'round five Mount Sumerus. Wide as the seas are his eyes, pure and clear. Are countless Bodhisattvas and infinite Buddhas. His forty-eight vows will be our liberation. This is mindfulness of the Buddha through contemplative reflection. 3. Mindfulness of the Buddha through contemplative visualization. This means reciting "Namo Amitabha Buddha" while facing an image of that Buddha. One should recite the phrase very clearly, hear it very clearly, and keep it very clearly in mind. 4. Mindfulness of the Buddha's Real Appearance. This is just Chan meditation. When we meditate, we investigate the question, "Who is reciting the Buddha's name?" We recite "Namo Amitabha Buddha" for two weeks, and then we try to find out who is reciting the Buddha's name. We have to find out "who" and not lose the "who." If we lose it, then we won't be able to get home. If we can't get home, we won't see Amitabha Buddha. One with Proper Faith, Proper Vows, and Proper Practice. Faith, vows, and practice are the three prerequisites of the Pure Land Dharma-door. One who goes on a journey takes along some food and a little money. One who wishes to go to the Land of Ultimate Bliss needs faith, vows, and the practice of holding the Buddha's name. Faith is the first prerequisite, for without it one will not have an affinity with Amitabha Buddha in the Land of Ultimate Bliss. You must have faith in yourself, faith in the Land of Ultimate Bliss, as well as in cause and effect, noumenon and phenomenon. What does it mean to believe in oneself? It is to believe that you certainly have the qualifications necessary to be born in the Land of Ultimate Bliss. You should not take yourself lightly and say, "I have committed so many offenses, I can't be born there." Suppose you have created karma involving heavy offenses, well, now you have a good opportunity: you can "take your karma with you into rebirth." That means that regardless of the offenses you have committed in the past, you can still be reborn in the Land of Ultimate Bliss, and that karma goes along with you. However, you need to know that the karma you can take is karma you have already created, not karma that you continue to create. Karma you have already created is the karma from previous lives. Karma you continue to create will ripen in the future. What you can carry is offenses that come from karma created in the past; what you cannot carry is offenses from karma you create now that will ripen in the future. No matter what you have ever done, not withstanding any kind of offenses, you can now change your faults and reform your conduct, stopping evil and becoming wholesome. Then you can take those previously-created offenses with you to the Land of Ultimate Bliss. But continuing to create karma will keep you from being able to go. Secondly, you must have faith in the Western Land of Ultimate Bliss which is hundreds of thousands of millions of Buddhalands from here. Before he realized Buddhahood, Amitabha Buddha, as the Bhikshu Dharma Treasury, vowed to create the Land of Ultimate Bliss where living beings of the ten directions who vowed to be born there could gain rebirth by reciting his name. There is no need to do anything else; it is easy, simple, convenient, and interpenetrating--yet it doesn't cost a thing and doesn't waste energy. This Dharma-door can be considered the highest and most supreme, for if you just recite, "Namo Amitabha Buddha," you will be born in the Land of Ultimate Bliss. It is also necessary to believe in cause and effect. Believing in cause is to believe that in the past you have planted good roots that now enable you to believe in this Dharma-door. Without good roots, no one can encounter this Dharma-door of reciting the Buddha's name, or any other Dharma-door, for that matter. Because of the good roots you planted in the past, you can now encounter the Pure Land Dharma-door of faith, vows, and holding the name. But if you don't continue to nourish the good roots you planted, then you won't be able to reap the fruition of Bodhi in the future. That is why you must believe in cause and effect; believe that in the past you already planted causes for Bodhi and so in the future you will certainly reap the fruition of Bodhi. The principle is the same as planting a field: the seeds must be watered and nourished before they can grow. Finally, one must have faith in phenomenon and noumenon. 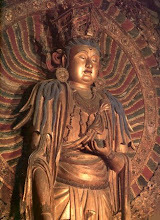 The specific phenomenon is this: Amitabha Buddha has a great affinity with us and will certainly guide us to Buddhahood. The noumenal principle is this: We know the great affinity exists because without it we would not have met the Pure Land Dharma-door. 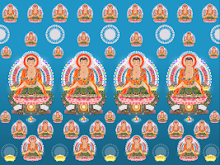 Amitabha Buddha is all living beings and all living beings are Amitabha Buddha. Amitabha Buddha became Amitabha Buddha by reciting the Buddha's name, and if we recite the Buddha's name, we, too, can become Amitabha Buddha. Considering the four Dharma Realms, and speaking from the standpoint of our self-nature, we and Amitabha Buddha are united in one, and therefore we have the qualifications to realize Buddhahood. 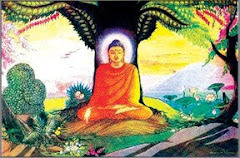 Amitabha Buddha is the Amitabha Buddha within the minds of all living beings, and living beings are the living beings within the mind of Amitabha Buddha. Due to this interconnection, there are phenomena and the noumenon. However, you must believe in this principle and energetically practice it by reciting the Buddha's name; you cannot get lazy. Your recitation of the Buddha's name should increase day by day, not decrease. I vow to save the limitless living beings. I vow to study the immeasurable Dharma-doors. "I want to be born in the Western Pure Land." "I want to be born there. Nobody's forcing me to go; nobody's dragging me there. Although Amitabha Buddha has come to guide me, I'm going as a volunteer because I want to be close to him. I want to be born in the Land of Ultimate Bliss and to see Amitabha Buddha when my lotus flower opens. I want to meet the Buddha and hear the Dharma." These are the vows you need. Then you must practice. How? Recite the Buddha's name, saying "Namo Amitabha Buddha, Namo Amitabha Buddha..." as if you were trying to save your head from the executioner, running ahead to keep your head. Faith, vows, and practice are the travel expenses for rebirth in the Land of Ultimate Bliss. They are your ticket. The Song of Mindfulness of the Buddha, the Dharma, and the Sangha. As we recite "Namo Amitabha Buddha" we each create and adorn our own Land of Ultimate Bliss. We each accomplish our own Land of Ultimate Bliss which is certainly not hundreds of thousands of millions of Buddhalands from here. Now, the Land of Ultimate Bliss really is hundreds of thousands of millions of Buddhalands away; and yet it doesn't go beyond the very thought we are having right now. Since it's right in our hearts, we say it's not hundreds of thousands of millions of Buddhalands from here. The Land of Ultimate Bliss is the original true heart, the true mind, of every one of us. If you obtain this heart, you will be born in the Land of Ultimate Bliss. If you don't understand your own original true heart, you will not. Amitabha Buddha and living beings are not distinct--that's why I say the Land of Ultimate Bliss is not so far away. In one thought, turn the light within. Know that originally you are the Buddha, and your original Buddhahood is just the Land of Ultimate Bliss. For this reason, you should cast out your defiled thoughts, your lustful desires, your confusion, jealousy, contrariness, selfishness and plots for personal gain. Be like the Bodhisattvas who benefit everyone and enlighten all beings. Just that is the Land of Ultimate Bliss. Don't you agree that the absence of confusion and false thoughts is the Land of Ultimate Bliss? If it isn't, what is? Don't seek outside. Good and Wise Advisors, you are all ones of great wisdom and great intelligence. You are all more clever than I, and in the future you will explain the Dharma better than I do. But now, because you don't know Chinese, I am introducing you to this old-fashioned tradition. In the future you'll transform it and make it unspeakably wonderful. It mentions the four shades of lotus blossoms. Who is the great sage and master? 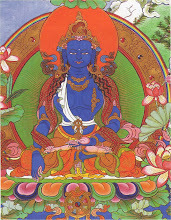 Amitabha Buddha is. Amita, the Great Sage and Master, serene, subtle, wonderful beyond all others. He is upright, adorned and very wonderful. There is no image as fine as that of Amitabha Buddha. Within the Pools of seven gems are flowers of four colors. Not only are the pools filled with seven jewels, the water forms waves of shimmering gold. 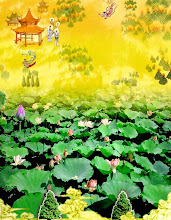 Wondrous Green, Yellow, Red, and White Lotus Flowers. The response from our reciting "Namo Amitabha Buddha" here where we are is that in the Land of Ultimate Bliss a lotus forms in the pools of the seven jewels, filled with the waters of eight meritorious virtues. The more we recite the bigger it grows, but it doesn't open. When we die, our intrinsic nature is born in that lotus in the Land of Ultimate Bliss. There are nine grades of lotuses, and how high a grade of lotus we are born in is determined by how much we recited the Buddha's name. Reciting more causes our lotus to grow bigger; fewer recitations result in a small lotus. "Well, suppose I don't recite at all?" If we stop reciting altogether, our lotus will wither and die. The grade of lotus depends on our own effort in reciting the Buddha's name. The Blowing Wind and the Calm Waters Proclaim the Mahayana. The mouth recites "Amita"and makes things of a piece. Scattered thoughts do not arise, samadhi you attain. For rebirth in the Pure Land, your hope is not in vain. Make rebirth in Ultimate Bliss your mind's essential aim. Cut off the red dust thoughts within your mind. Put down impure reflections, and pure thoughts you will find. Recite the Buddha's name from morning to night and your confused thoughts will not arise. You will naturally attain the Buddha-recitation samadhi and be reborn in the Land of Ultimate Bliss, according to your will. You know that the Saha world is full of pain and suffering; so cut off worldly pleasures and have no thoughts of sexual desire, craving, or struggling for fame and profit. Put down all worldly concerns and view them as false. Seek rebirth, ultimate bliss; this thought of rebirth is extremely important.This verse clearly explains the principles of reciting the Buddha's name, and if you carefully savor its flavor, you'll find it very helpful. One Mind Unconfused Is Samadhi. Reciting the Buddha's name every day in a recitation session, we are planting the seeds of Buddhahood. Each recitation sows a seed; ten recitations sow ten seeds. If you recite a million times a day, you plant that many seeds, and one day they will sprout. Just recite; don't worry about having a scattered mind. the muddy water becomes clear. the confused mind attains to the Buddha. Reciting the Buddha's name is like throwing a pearl into muddy water so that the muddy water becomes clear. This clear-water pearl can purify even the filthiest water. Recitation of the Buddha's name is just like this pearl. Who can count the false thoughts which fill our minds and succeed one another endlessly like waves on the sea? When the Buddha's name enters a confused mind, the confused mind becomes the Buddha. Recite the name once and there is one Buddha in your mind; recite it ten times and there are ten Buddhas; recite it a hundred times and there are a hundred Buddhas. The more you recite, the more Buddhas there are. Say, "Namo Amitabha Buddha," and there's a Buddha-thought in your mind. When you are mindful of the Buddha, the Buddha is mindful of you. It's like communication by radio. You recite here, and it's received there. There is that kind of response. When you recite the Buddha's name, you don't have any other false thoughts, so your inherent nature has inconceivable merit and virtue. When All Thoughts Are Empty, One Enters the Lotus Land. Our restless mind is constantly looking for something to keep it busy. To set it at ease, we give it the task of reciting "Namo Amitabha Buddha." This is also a form of Dhyana meditation. You don't have to sit in lotus posture with your eyes closed, like Dhyana Master Linzi, to investigate Dhyana. You can also meditate with your eyes open. Walking is Dhyana, sitting is Dhyana. One is always at peace. A teacher of humans in this life, a Patriarch or Buddha in the next. With Dhyana but not Pure Land, nine out of ten go astray. With Pure Land but not Dhyana, ten thousand cultivate and ten thousand go. The Pure Land Dharma-door is the easiest method of practice. All the great Bodhisattvas have praised it. 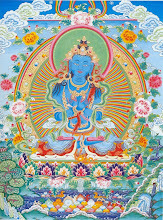 Manjushri Bodhisattva praises it, and Universal Worthy Bodhisattva, in the "Conduct and Vows of Universal Worthy" chapter of the Flower Adornment Sutra, exhorts all living beings to seek rebirth in the Pure Land. He himself recites the Buddha's name and seeks rebirth as well. Guanshiyin Bodhisattva is also mindful of the Buddha, and in the Shurangama Sutra, Great Strength Bodhisattva praises this Dharma-door of reciting the Buddha's name and describes how he obtained perfect penetration by means of it. Thus, all the great Bodhisattvas of the past have praised and cultivated the Pure Land Dharma-door.The patriarchs of the past all first investigated Dhyana, became enlightened, and then exclusively recited the Buddha's name. There were those who, every time they recited the Buddha's name, would have a transformation Buddha come out of their mouths. Dhyana Master Yong Mingshou was that way. 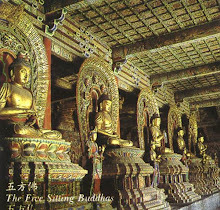 More recently, Elder Master Yinguang exclusively advocated mindfulness of the Buddha and Elder Master Hsu Yun also advocated reciting the Buddha's name. It is the easiest, most convenient, and most perfect Dharma-door, praised by all Buddhas of the ten directions. Doesn't the Amitabha Sutra describe how the Buddhas of the six directions each bring forth a vast and long tongue covering the three thousand great thousand worlds to praise this Dharma-door? This is the best practice, and everyone should take it up especially in the Dharma-ending Age. However, since we are upholding the Proper Dharma Age here, if you choose not to recite the Buddha's name, then you should investigate Dhyana (meditate) as if your lives depended on it! Don't fear suffering! Suddenly Awakening to Non-production, One Sees the Buddha. In the Dharma-ending Age, recitation of the Buddha's name is a most important Dharma-door. Don't take it lightly. Every time Dhyana Master Yong Mingshou, the Sixth Patriarch of the Pure Land School, recited the Buddha's name, a transformation Buddha came out of his mouth. Those with the Five Eyes and Six Spiritual Penetrations could see it. When you recite the Buddha's name, you emit a light which frightens all weird creatures and strange ghosts away. They run far, far away and leave you alone. So the merit and virtue of holding the Buddha's name is inconceivable. Attaining Wonderful Enlightenment Is Our Personal Responsibility. Don't see the Buddha-recitation as true, and don't regard it as false. If you practice skillfully, it becomes true. If you practice poorly, it turns into something false. All Dharma-doors are like this. Proper and deviant depend on the person.When we bow to the Buddha, we should make this contemplation: "My body pervades limitless Buddha lands as I bow before each Buddha in each Buddha land." Contemplate your body as expanding to fill the entire Dharma Realm. Everything is made from mind alone. May All Virtuous Ones Work Hard Together. Everyone can practice the Buddha-recitation Dharma-door. All you have to do is recite "Namo Amitabha Buddha," and at the end of your life you will be born in a lotus in the Land of Ultimate Bliss, where you will hear Amitabha Buddha speak Dharma and eventually attain Buddhahood. "Death is still far off," you say, "why should we recite the Buddha's name now?" You must develop your skill in reciting right now, so that you will remember to recite at the time of death. 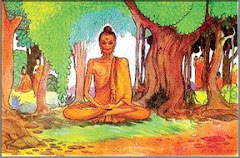 Just as a tree must grow for many years before it becomes a hundred feet tall, you must begin practicing reciting the Buddha's name now so that when it comes time to die, you will be able to recite single-mindedly, without sickness, greed, hatred, stupidity, or confusion, and Amitabha Buddha will come to guide you. If you don't recite now, you won't remember to when your body starts to fall apart at the time of death, unless a Good and Wise Advisor is there to remind you and help you. Therefore, it's important to recite the Buddha's name every day and enter the Buddha-recitation samadhi, so that reciting will come naturally at the time of death and you won't forget. Or if you are unable to recite Namo Amitabha Buddha, Amitabha Buddha won't forget you and so he will come riding the ship of his great vows, receive you onto a golden dais, and take you to the Land of Ultimate Bliss. He won't forget about you. 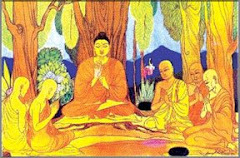 Why are we mindful of the Buddha? So that everywhere is ultimate bliss, everywhere Amitabha. With no you and no me, what is there? In still contemplation, the myriad things are understood. Leap out of the Triple Realm's great river of love. 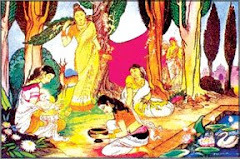 Foolish people recite the Buddha's name, hoping the Buddha will give them some good food to eat. Some recite, "Namo Amitabha Buddha, Namo Amitabha Buddha, please give us some warmer weather!" Other people recite hoping to obtain good luck and happiness, or to escape problems and suffering. The primary purpose of reciting the Buddha's name is to end birth and death, that is, to have control over our own births and deaths. If we want to live, we can recite Amitabha Buddha's name day after day and live forever. If we want to die, then we recite "Namo Amitabha Buddha" and the Buddha will come to receive us. We will be free of illness, greed, and delusion, as if entering samadhi, and we will be reborn in the Land of Ultimate Bliss with no problem at all. Secondly, if we recite the Buddha's name, we can transform the Saha world itself into the Land of Ultimate Bliss, where beings endure none of the sufferings and enjoy every happiness.Recite to the point that you, me, the Buddha, and everything else disappears. "That's too dangerous! If everything is gone, won't we all be finished?" you say. It's only to be feared that you won't be finished. If you are truly "finished," then you are free. At that time, you will understand the myriad phenomena of the world, such as why crows are black and cranes are white, why pines are straight and brambles are twisted. Since you understand everything, afflictions are cut off, ignorance is smashed, and you leap out of the great river of love that courses through the Desire, Form, and Formless Realms. In the Triple Realm, we are so deluded by love, loving each other until we die, and then coming back for another round, never waking up enough to escape. Now, however, we want to leap out of the river of love. "I don't want to," someone says. Then you can undergo a few more rounds of birth and death. With each round, you sink lower and lower, until you sink to the very bottom of the river of love! Drowning represents your soul being split into many small creatures, such as mosquitoes and ants. These insects have low intelligence, few blessings, and very short lives. The Western Land of Ultimate Bliss Is Your Home. In this world, nothing is fixed before it happens. The future can always be changed. For example, before we recited "Namo Amitabha Buddha," we didn't have the qualifications to be reborn in the Land of Ultimate Bliss. Once we recite, we become qualified. Even if originally it would have been difficult for you to be reborn in the West, once you recite it becomes possible. On the other hand, even if you could be reborn in the West with a single recitation, if you don't recite once, you won't get there. So nothing is fixed. The Vajra Sutra says, "There are no fixed dharmas. This is called Anuttarasamyaksambodhi." That is the method for attaining unsurpassed, proper and equal, right enlightenment. We should advance courageously, undaunted by suffering, difficulty, cold, and hunger, until we arrive at the Land of Ultimate Bliss. Reciting "Namo Amitabha Buddha" is what really counts. In reciting, the most important thing is to end birth and death.